In the midst of a federal government shutdown driven by disagreements over border security, U.S. Rep. Greg Walden held a town hall in Prineville where that topic and others were discussed at length. 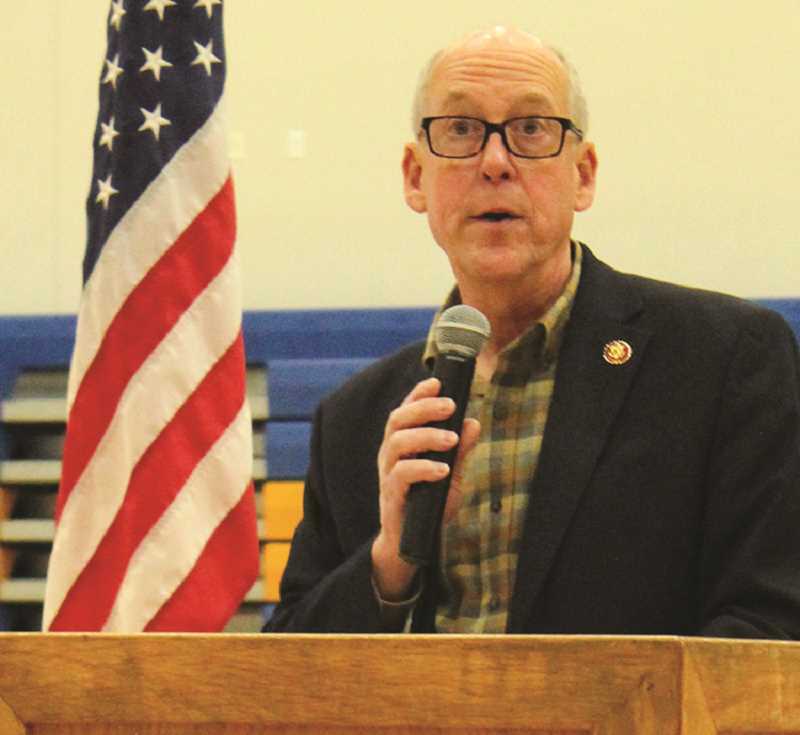 Walden kicked off the session, which drew about 150 people to the Crook County High School gym on Sunday afternoon, by addressing his views and voting regarding the shutdown. "I broke with my party to reopen some of these agencies like the Bureau of Land Management, the Forest Service and others that have nothing to do with debate over border security," the Republican congressman said. "I voted to fund those agencies, and I will continue to do so." Continuing on the subject of border security, Walden stressed that he supports efforts to improve what he considers a problem that needs addressed. "That doesn't mean you build a wall from one end to the other, but it does mean you put in visible security where it makes sense, use technology where it makes sense and get security for our border," he said. Walden went on to stress that he does not support separating immigrant children from their parents, calling the decision bad policy, and adding that he voted for legislation to make sure it never happens again. "We clearly have both a humanitarian problem at the border as well as a security problem at the border, both of which need to be addressed," he said. The congressman later shared with the audience some specifics about a proposed border security package he supports which includes adding a couple thousand patrol agents and 75 teams of lawyers and judges to more quickly adjudicate immigrant asylum cases as well as $800 million in funding for humanitarian relief and a couple hundred miles of wall. "It is fencing, it is high tech, it is judges, it is more patrol agents, it is the whole package," he said. Regarding the ongoing government shutdown, Walden told the audience that this past week he voted on an amendment that would have paid all of the furloughed BLM and Forest Service workers through Jan. 15. "The president wouldn't sign that," he said. "Until the president and the Speaker and the folks in the Senate get together, we're stuck in this thing." Improving forest management remains a goal of Walden's, and he noted that some progress has been made that has been helpful. Among the improvements was passage of legislation that will address "the fire borrowing issue." He explained that the Forest Service would take money from funds designed to complete forest treatment to fight fires. Starting in 2020, the legislation will prohibit that practice. Walden went on to say that he and his congressional colleagues expanded categorical exclusions by 3,000 acres "to more rapidly thin out the overstocked forests," and passed a Good Neighbor Policy. "So now, counties can team up with the Forest Service to help do the kind of work that needs to be done in the surrounding forests," he said. During the roughly 75-minute town hall, Walden spent the majority of the time fielding comments and questions from the audience. Questions ranged from health care to climate change to youth e-cigarette use to Second Amendment rights. When pressed about why America doesn't embrace universal, single-payer health care like many other countries throughout the world, Walden noted that because of the high cost of health care in the U.S., it would cost about $32 trillion to make such a change. "What I am looking at is how in America do we get costs down," he said, adding that he would like to identify areas where there is competition to drive health care costs down. He pointed to legislation that sped up the timeframe in which generic versions of prescription drugs hit the market, which in turn improved competition and drove down drug prices. Another audience member asked about climate change. "We should be concerned about climate change, and there are things we should do about it," Walden said, before referencing some recent improvements in the reduction of carbon emissions. He noted that America is now at 1992 levels of emissions and added that last year, 16 gigawatts of coal power went off line that was replaced by natural gas power generation. "I am for innovation, I am for conservation and adaptation," he said. "I am not so much into taxation and regulation because I believe we can do a lot through innovation." He suggested advances in technology for existing hydroelectric facilities could help reduce carbon emissions as well generating nuclear power, and highlighted research into large-scale battery storage. "If you can get grid-scale battery storage, you can better utilize renewable energy (such as solar or wind power)," he said. Walden went to on to tell the audience about companies and scientists who are developing techniques to capture carbon emissions at manufacturing plants and remove them from the manufacturing process. "There are a couple of other companies that are looking at devices that remove carbon directly from the air and cycle it through and produce some other things out of it," he said. Concluding the forum, Walden thanked everyone for taking time from their Sunday afternoon to attend the event. "Thank you for engaging in this civil discourse," he said, "and even where we have differences, let's all agree America is the best place to live, and God bless everybody."